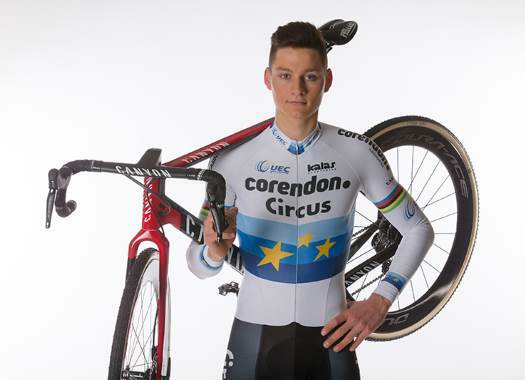 Mathieu van der Poel has taken his third victory in a row at the Cyclocross World Cup. The Dutchman crossed the finish line ahead of Wout van Aert and Toon Aerts. The sand stretches of the course Duinencross Koksijde, in Belgium, makes it important to have a good start. Van der Poel showed once more his skills by riding away in the first metres, only accompanied by Lars van der Haar. After five minutes of racing, the European champion changed the pace and left Van der Haar behind and continued on his own, which he could maintain until the end of the race. Van Aert crashed early on the race and had to start pursuing to achieve a good position at the end of the race. By the middle of the competition he was already in the second spot and without any possibilities to catch the Dutch rider in front, he settled with that. The current leader of the World Cup, Toon Aerts crossed the finish line in the third position and maintained his spot at the top of the classification. Dutch rider Denise Betsema took the victory on the women's competition after attacking with two laps to go. This is her first win in the World Cup. Marianne Vos keeps the lead at the Elite Women's standings.